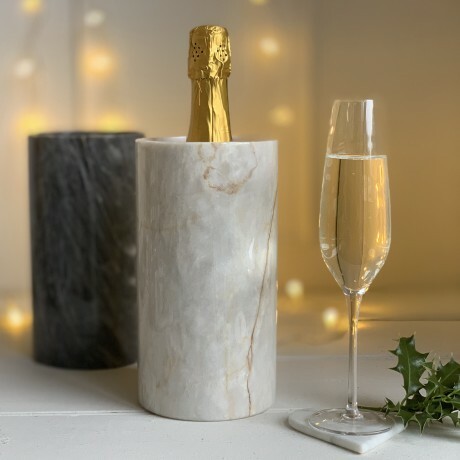 Marbletree's marble cooler, designed by them, is handcrafted from one piece of marble. 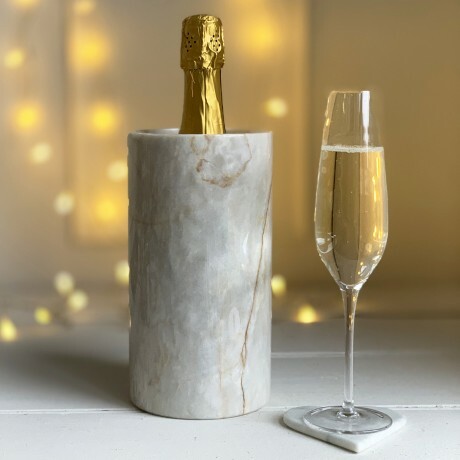 It is very efficient and one of their most popular lines as the natural properties of the marble will keep your wine or champagne chilled with no need for ice. Marble stone has superior thermal mass giving it the natural ability to retain its temperature. If your wine is not chilled you can also chill your cooler in the fridge or freezer before use. Available in dark, light or cream marble colours. Choose using the option available. Due to the natural properties of marble the colour and markings will differ between products. The pictures shown are a good representation of their current available stock. Coolers come in a beautiful black box with a hand tied ribbon, and Marbletree can also add a gift message for you. I ordered two of these pestle and mortars, one for myself and one as a gift. Prompt delivery and beautifully packed. I would recommend this product to anyone, it's first class. Thank you so much. Stunning accessories handcrafted from beautiful quality marble, slate and other traditional materials.